That’s the one thing about the Whole30 Challenge, if you don’t like to cook, this will be very hard for you. The only way to ensure that there is no sugar, gluten, soy, canola oil or any other Whole30 no-nos in your food is to make it yourself. Honestly I do not enjoy cooking so much, but I do enjoy eating the healthiest way possible, so I cook breakfast, lunch and dinner about six days a week. I rest on Sundays (it’s a commandment you know) and we eat dinner from a selection of carefully chosen restaurants that are Whole3o friendly. I have been cooking Paleo for awhile and in doing so, I just tweaked my normal recipes to eliminate gluten, which really wasn’t too hard. Switch out a bun here and add some lettuce there. I didn’t eat much pasta anyway and was happy to use zucchini “noodles” in it’s place. Sweet potatoes instead of white potatoes was a preferred switch. It was the elimination of sugar and dairy for the Whole30 that made me purchase cookbooks for new meal inspiration. I read each of these cookbooks from cover to cover and tagged recipes that I thought my family would like. 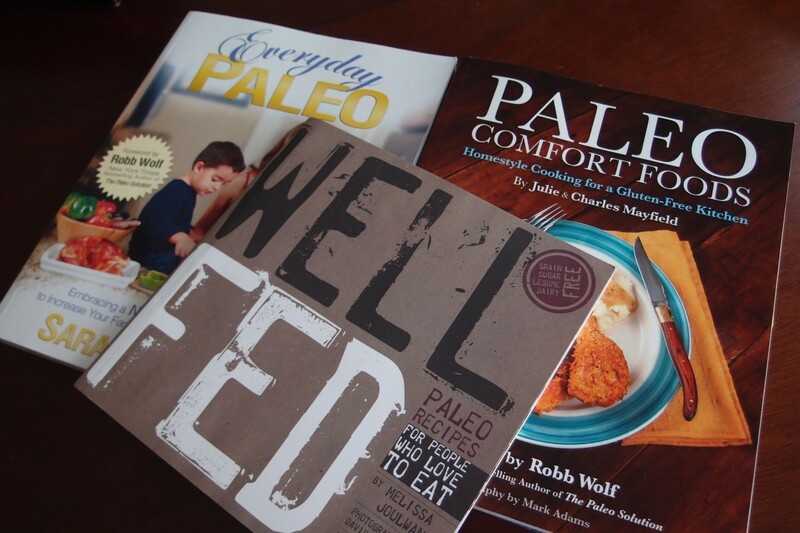 Each book is fantastic in it’s own way and each book also has a great section about the philosophy of eating Paleo. Everyday Paleo has more family-friendly everyday type of meals, while Paleo Comfort Foods takes many of your favorite comfort foods like fried chicken and makes them Paleo; the photos are also gorgeous in this cookbook. Well Fed‘s tag line “Paleo Recipes For People Who Love To Eat” is very true; the recipes in this book make your mouth water. You can cook an entirely Paleo dinner for non-Paleo friends and they wouldn’t be the wiser and will in fact rave about the meal and ask for the recipe. My fourth cookbook is the iPad app by Nom Nom Paleo – delicious recipes, witty prose and quality photos make for an impressive and much used app in my kitchen. I would say 90% of the recipes in all of these cookbooks are Whole30. The 10% that are not Whole30 are mostly Paleo treats that use honey. My daughter is eager for me to try some of these after the Whole30 is finished and we are back to eating just Paleo. Yes, I cook almost every day. Yes, I spend much money on quality produce and meat. But it’s worth it. My family’s health is worth it. I’m cooking Whole30 and my meals have been epic. See, this can be done. I hope I’ve inspired you to give it try! Thank you so much for introducing this to me. I thought the ‘no sugar’ would be hard but during my ‘whole30’ practice week had a sweetend almond milk chai tea and I got sick with all the digestive discomforts that led me to re-evaluating my food choices several years ago. I was ready to go and have been doing this for 2weeks and loving it! I plan to go Paleo after this but honestly, I’m not missing a thing on Whole30 and feeling good! BTW the raspberry cream sauce in the Whole 30 is great with the fluffy coconut pancakes! Your menu grid is perfect for someone like me who needs more of a ‘turn key’ solution. Thanks for sharing! Robin, I’m so glad to hear that it’s going well! It just gets easier!